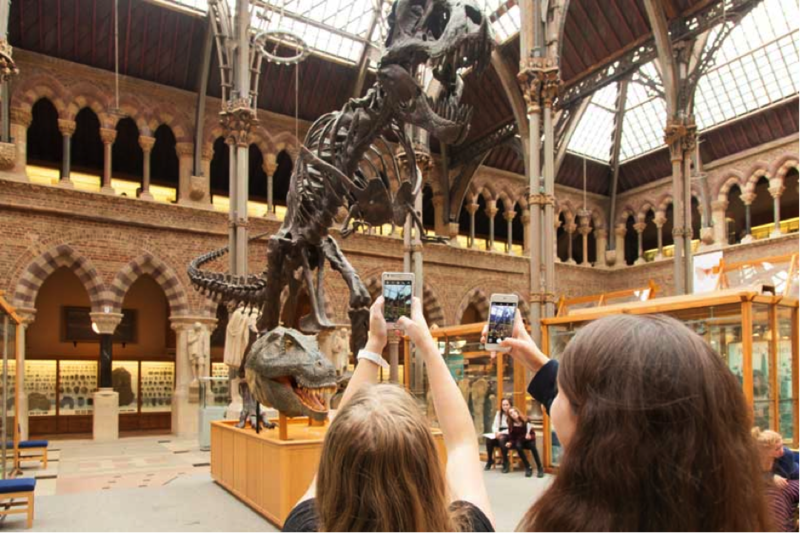 With funding and support from the University of Oxford’s IT Innovation Seed Fund (now IT Innovation Challenges), over the last 12 months a small team of colleagues from the Oxford University Museums and the University’s IT Services Mobile Development Team have been working on a project to look at best practice for engaging visitors in gallery spaces using mobile devices. 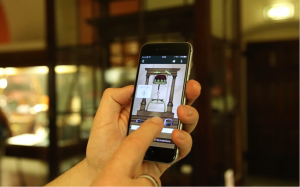 Mobile presents a significant opportunity for museums and other cultural venues to offer engaging content and deeper interpretation to audiences visiting their sites, which simply can’t be delivered using traditional methods. However, mobile also represents a challenge: when visiting a museum or venue audiences are seeking to engage with the historic site and authentic, ‘real’ collections on display. Mobile interactives can be notoriously ‘heads-down’, drawing the user into their device, rather than engaging them with their material surroundings. In the Hidden Museum project we set out to understand how mobile could best be utilised to deliver engagement rather than distraction. How could we use mobile in a way that does not draw users into their devices, but rather encourages them to look more closely at their surroundings and the objects on display, and through the digital content helps them gain a better understanding of those objects? Phase One: Research – We undertook desk research to understand current mobile engagement research and initiatives in order to identify gaps in existing knowledge and frame our research questions. Phase Two: Iterative Testing – Having identified outstanding research questions, we adapted existing mobile content from all the museums for user testing to answer specific questions, making iterative changes to fix problems and address new questions raised. Phase Three: Prototype Development – We developed a prototype app for one of the museums, building on all the learning gathered in the first two phases, and allowing for user testing of a complete experience, rather than component parts. You can read details about the research and iterative testing phases of the project at http://www.oxfordaspiremuseums.org/blog/hidden-museum-project, where we have shared some of our research questions and key insights gained. The culmination of the project was the development of ‘Pocket Curator’, an app for the Museum of the History of Science. Housed in the original Ashmolean building, the Museum of the History of Science displays complex scientific instruments, which can be difficult for visitors to engage with when they see them on static display behind glass – scientific instruments are meant to do something! Our aim was to bring these instruments to life by allowing the user to try them out, using their mobile device as proxy. We built a series of instrument interactives: the user could use their device to simulate the use of a sextant to determine their latitude; experiment with their own digital lodestone; recreate Marconi’s wireless demonstration of 1896; and convert between 12-hour and decimal time, referencing an unusual ‘Revolutionary’ clock with a ten-hour face. These interactives were imbedded within an app delivering more traditional audio and visual content, optimised to work in the museum space. Audio was broken into short stories focussed on a single topic, allowing the user to dip into areas that interest them rather than listen to long, comprehensive recordings. Video content was presented in an animated style to distinguish it from the objects on display, pushing the user to look from the screen to the object in order to see the details explained. We used image recognition to trigger content, encouraging the user to engage with the object before focusing on the app. The prototype, built in iOS only, was well received by our user testing group who found that the engagement increased both their specific understanding of the scientific instruments featured in the app, and their general appreciation of the collections held by the museum. The success of the prototype enabled us to leverage additional funding to take the iOS app from prototype to product, and develop an Android version, both of which will be released in the app stores in September 2016. The core project team comprised Scott Billings, Digital Communications Officer at the Museum of Natural History ; Theodore Koterwas, Web and Mobile Application Team Lead within IT Services; and Jessica Suess, Digital Partnership Manager for Oxford University Museums. However, a significantly broader team of developers, designers, artists and curators contributed their talents to make the project successful; one of the best parts of working on this project was that it was truly collaborative and cross-disciplinary. Find out a little more about the project at http://podcasts.ox.ac.uk/hidden-museum-connecting-collections-context ; a presentation by the project leads as part of the Digital Humanities at Oxford Summer School. A great technological innovation for sure. Imagine high tech in a museum! Very inspiring.